Beaudry’s work is influenced by the “lure of the local”, as Lucy Lippard describes, the sense and pull of a place. For Beaudry this is the land, geography and activities of the north. As a Fran- co-Ontarian artist originally from the rural region of Témiscamingue, she often return to the area to find inspiration in its location and her experiences that stem from it. Coming from a European and colonial history, Beaudry’s connection to this land is complicated by the cruel acts of her ancestors. Recently, her exploration of the “local” continues with a reinvestigation of her archive of family photographs. In this exhibition, Beaudry works with imagery of water and land, with a particular attention to their meeting point. This encounter was an entry point for settlers. 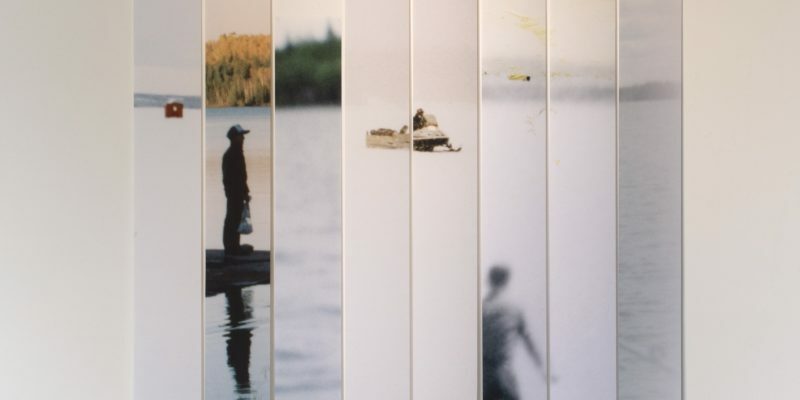 Beaudry uses fragments of these photographs where the point of view or the settler presence shifts from standing on land to looking towards land. At times empty, at times occupied by activities typical of her experiences in these spaces, the fragmented landscape is an interference on the form and narrative of the image. Lise Beaudry is a Franco-Ontarian artist based in Toronto. She holds a BFA from Concordia University (1997) and an MFA from York University (2006). Beaudry is a professor in the Art and Art History program at Sheridan College and the University of Toronto in Mississauga. We are partially physically accessible. We have a level entrance leading to our shop, information desk, galleries, washroom and traditional print studio. Unfortunately, we do not have automatic doors or an elevator. We are working toward becoming a physically accessible space in the future.